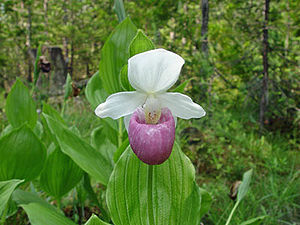 The Pink and white lady’s slipper (Cypripedium reginae) was adopted as the Minnesota State flower in 1902. It is also sometimes known as the showy lady’s slipper or queen’s lady slipper. The lady's slipper is one of 43 orchid species that grow in Minnesota. It is a brightly-colored orchid in colors of pink, red, white, and green, with one or two blossoms on a single stem. White petals sit on top of a white pouch (or "slipper") streaked with pink, and oval leaves clasp the stem. Lady's slippers grow best in damp woody areas where there is plenty of light. In Minnesota, they grow best in spruce and tamarack bogs, swamps, wet meadows, wet prairies, and cool, damp woods. The plants grow very slowly, taking up to 16 years to produce their first flowers. They commonly bloom in June and July. Most plants grow to around two feet high, but can grow to up to four feet tall. They have a very long life span, and left undisturbed can live 50 years or longer. Since 1925 this rare wildflower has been protected by Minnesota state law (it is illegal to pick the flowers or to uproot or unearth the plants) and it is classified as a rare or endangered flower in Maine. This page was last modified on 27 June 2016, at 20:21.